FEZ (Freakin' Easy!) 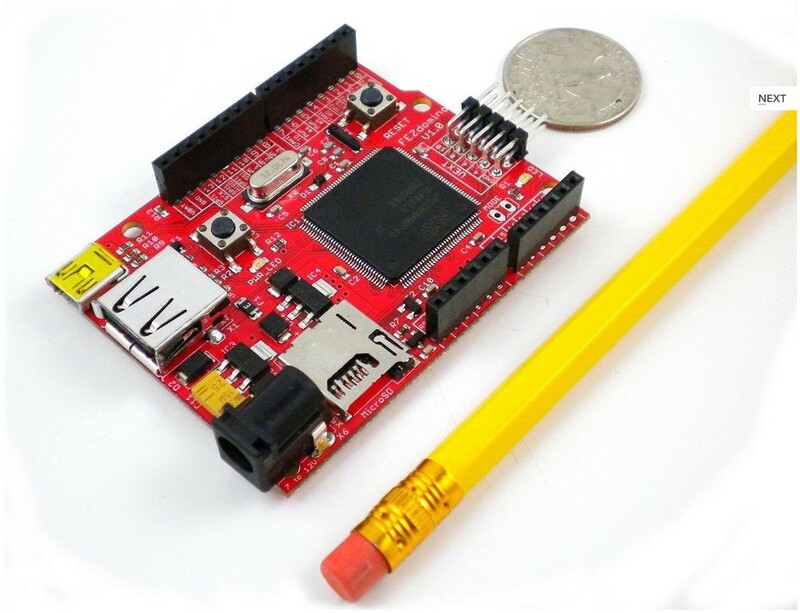 is a tiny open-source board running Microsoft .NET Micro Framework. This means, you can write code with much more efficiency using C# programming language under free Microsoft Visual C# express. Build your next projects in minutes by connecting FEZ Domino to one of the shields or the many available components. Includes USB cable. You can see that FEZ Domino's outline looks similar to Arduino Duemilanove. The reason for this compatibility is that many shields already exist for the Arduino board. TinyCLR.com offers several shields (Ethernet, Display, Motor Driver, etc.) that are fully tested and supported with FEZ Domino. Furthermore, with the FEZ Domino Expansion shield and onboard extension header, the user can easily add extensions and components. This allows FEZ Domino to remain simple yet extremely flexible, making it one of the easiest devices to use in the embedded market. Many libraries are already included like FAT file system, threading, USB Client, USB Host, UART, SPI, I2C, GPIO, PWM, ADC, DAC and many more. The similar form factor between FEZ Domino and Arduino allows developers to use almost any of the available Arduino shields. While using the same shields, FEZ offers greater flexibility and far more features. Starting with Microsoft Visual C# Express and the possibility for debugging and ending with high-end libraries like USB host, USB device, threading, XML and many others. Not to forget that FEZ Domino has extra 8 IOs at the UEXT connector and the USB host, USB device, SD card are all connected directly to the processor and so using those will not reduce your free IO count. (we use SD in real SD mode which requires 6 pins). Note that all digital/analog pins, PWM, COM1 and SPI are in the same place, other peripherals can be different. For example FEZ Domino provides three serial ports that are available for developers. Arduino only has one and it is used for debugging! Get FEZ Domino-an Microsoft .NET Micro Framework powered controller from DFRobot Store or DFRobot Distributor.